As the Gilgit Baltistan glaciers melt, residents of Gilgit Baltistan are left facing hygienic water shortages. 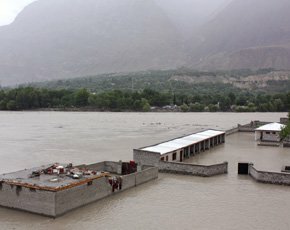 “It’s been four days since there was water in our homes,” said Waqar Ahmed, a resident of Gilgit, as the crisis intensified forcing people to go out in search of water with buckets in their hands. “We are not able to wash up nor do we have water for drinking,” said Shaista Khan, a schoolteacher living in Jutial. Officials at the Water and Sanitation Department (WASA) said that floods triggered by melting of snow at glaciers swept away the main water reservoir at Kargah, forcing the suspension of water supply to the city. More than 20,000 people in Jutial, Khomer, Konodas, Kashrote, Nagral, Majini Muhalla, Yadgar Muhalla, and Barmas have been affected by the water shortage. In Kashrote, people complained that the water filtration plants also shut down the day tap water stopped flowing. People in Jutial said that they tried to hire a water tanker but said that drivers demanded Rs1,500 for one trip. “It was too expensive for people like us to bear,” said Latif Ali, another resident of the town. Meanwhile, the water level in Gilgit River and adjacent tributaries has increased manifold as rising temperatures have intensified the melting of glaciers. As a result, siltation has also increased in the water, leaving it undrinkable. Ironically, G-B’s glaciers are the source of most of Pakistan’s water supply. This week, Gilgit recorded its hottest day of the year, with the temperature jumping to 40 degrees Celsius.